The Forest of Dean is only an hour's drive away from my home in Oxfordshire and it has given me much pleasure over the years to visit as it is renowned for its special birds such as Hawfinches and Goshawks and just as importantly it is also a lovely place to wander around in and experience its other worldly ambience, almost as if you have taken a step back in time. Apart from the birds there is another well known and sought after resident of the forest that divides opinion but is nonetheless rather special and that is the Wild Boar. Unfortunately Britain's indigenous Wild Boar were hunted to extinction in medieval times but animals from the Continent were imported to Britain for meat farming in the 1980's and escaped animals re-established themselves in the wild in the early 1990's. 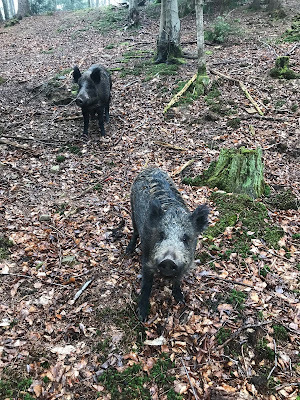 Another sixty boar were illegally released in the Forest of Dean in 2004 and subsequently split into smaller groups (called sounders) dispersed throughout the Forest. 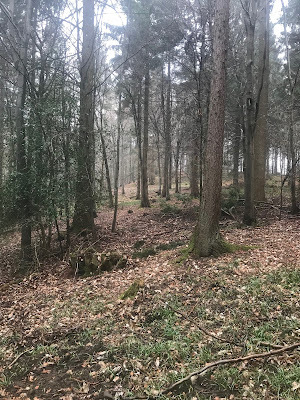 In England they can now be found not only in the Forest of Dean in Gloucestershire, their ancestral home but on the Kent/East Sussex border, in Dorset, Devon and have also spread into Monmouthshire in Wales which lies adjacent to the Forest of Dean. They are unknown in Scotland. 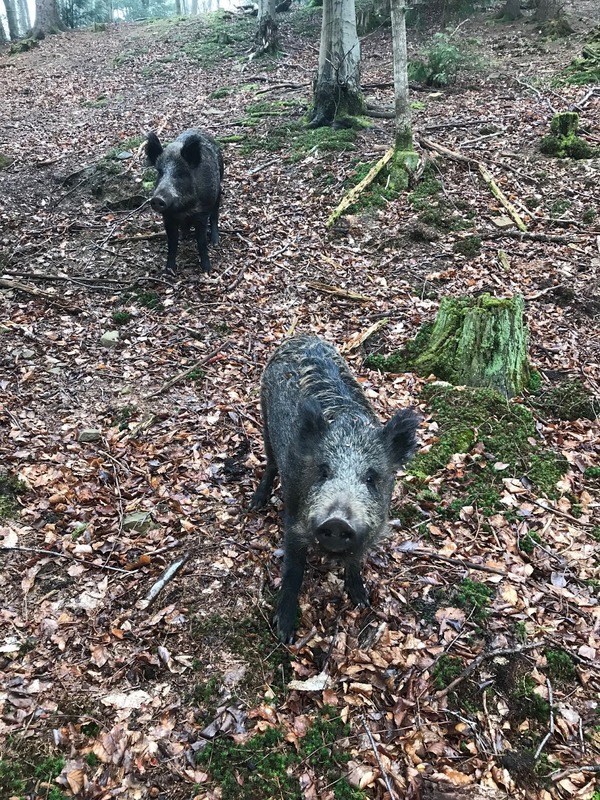 The Forest of Dean is probably the place to try and see Wild Boar in England and the population has now grown to in excess of 1200 individuals as the boar have no natural predators, recent winters have been mild and when they do venture near to human habitation they are often fed with scraps or find discarded food at picnic sites. Inevitably the growing numbers of boar have brought them into increasing conflict with humanity and more are now killed on the roads that bisect the forest than deer.They also cause much damage to the ground where they forage for food, nosing under the turf with their shovel like snouts for tubers and earthworms, leaving the roadside grass verges looking like a ploughed field. Football and Cricket pitches, private gardens and even graveyards have to be surrounded by fences or stone walls to prevent the boar encroaching and doing damage. 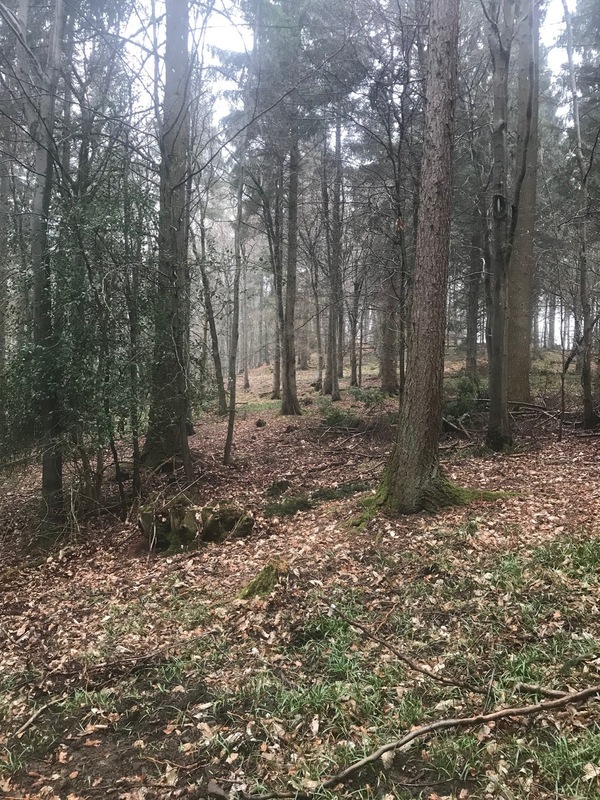 Most of the land they inhabit in the Forest of Dean is owned by the Forestry Commission which is actively culling the Wild Boar with the long term aim of reducing the population to around 400 individuals. Consequently it is not normally easy to see a Wild Boar now as they have become wary and remain secretive, very shy and generally shun the proximity of human habitation during the day preferring to remain hidden in the depths of the forest and only coming out at night to forage. The Wild Boar have polarised opinion, with most residents of the Forest pro culling but a minority are against it, so much so that there is an active saboteur group which try to disrupt the culling. Visitors such as myself wish the Wild Boar no harm and are generally delighted and excited to see one, which is often a highlight of a day out in The Forest and photographers are increasingly seeking them out too. Speaking to a photographer colleague on the weekend I asked him about some great close up images he had recently got of Wild Boar in The Forest and he told me of a place where three or four adult boar plus two very cute piglets had become familiarised to humans and showed little fear and indeed would approach you, rather than is the more usual case, run away the minute they see you. 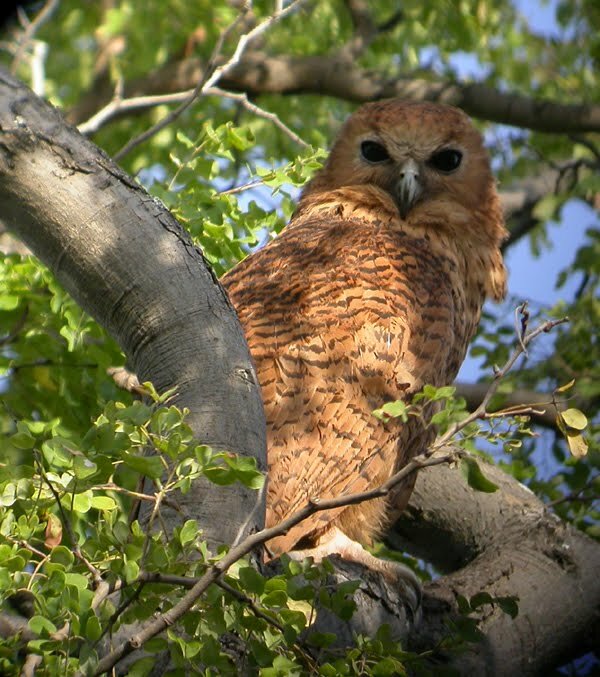 They were also active in the daytime and one had only to walk around in a certain area before they found you rather than the other way around. This was too tempting an opportunity to pass up as I have always wanted to see a Wild Boar close to but up to now have had to be content with just fleeting views of their distant shapes melting away into the depths of the forest as they fled from my presence. I resolved to go to the forest today and on a murky, dull and grey, dispiriting kind of morning found myself parking the car at the entrance to a forestry track and walking into the trees in search of the Wild Boar. 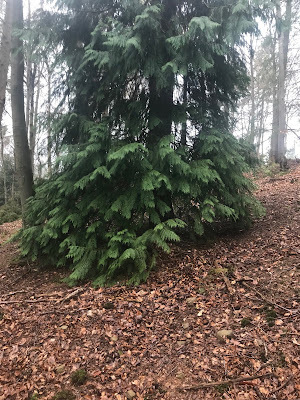 It was wet and very muddy underfoot after a night of rain and the ranks of Corsican Pines created a green damp gloom all of their own as I wandered off the muddy track and onto a forest floor carpeted deep in leaf litter. It was quiet and still below the trees with just the melancholy refrains of Blackbirds singing and a distant Mistle Thrush casting his rambling whimsical song skywards from high in an Oak. I had been instructed to just wander around and eventually I would come across the boar but after some thirty minutes all I had to show for my efforts was a distant glimpse of three adults and four piglets running away from me as fast and as far as they could. These surely could not be the familiarised ones I had been told about? 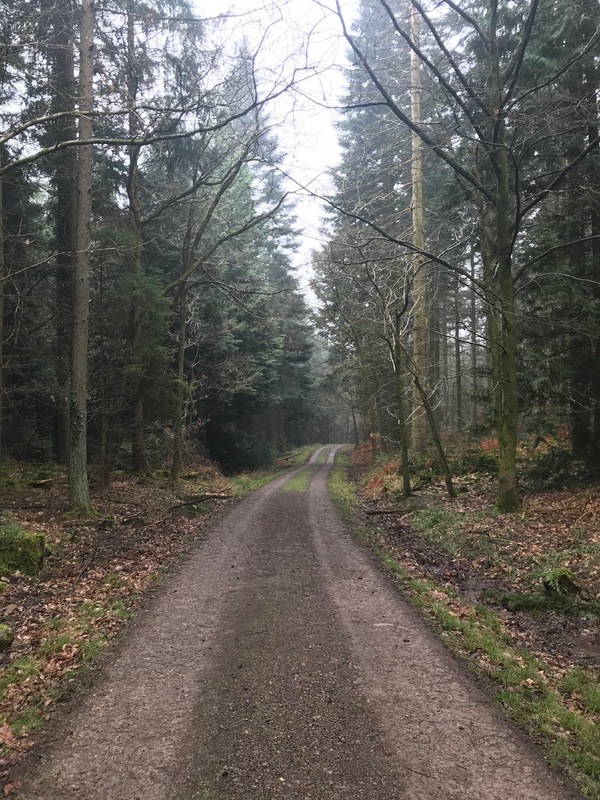 I carried onwards, slowly walking up a rising gradient, looking back down a steep slope that fell away from me for some way, to a wide track at the bottom, kicking the dead leaves at my feet disconsolately and trying not to trip over fallen branches and tree roots. 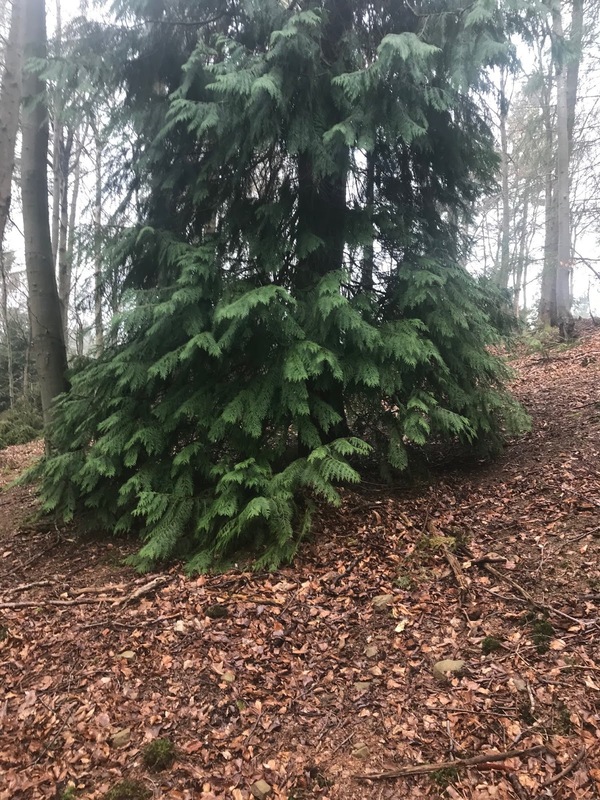 It was a slightly more open area here, although I was still below the canopy of the trees and as I approached a small conifer a large, dark hulking shape rose to its feet and emerged from under the tree where it had been resting on a bed of accumulated dead leaves. It was so unexpected I was totally surprised and just a little alarmed. I had found my Wild Boar. It was big, larger than I had imagined and rather than run away it looked at me quizzically and myopically down its long snout before taking a few more steps towards me and then halting as if unsure about my intentions. I too was just as unsure about its intentions. This was a wild animal and a big one and could do me serious harm if it had a mind to. It was a standoff for a few moments and then the boar, although not coming right up to me, approached close enough to cause me to retreat in order to be able to get a full image of it in my camera's viewfinder. Then to my surprise another boar emerged from under the same conifer. It was even bigger, a magnificent male. I just stood and admired this specimen. 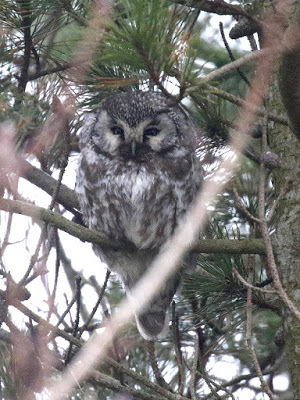 Impressive is the only word to describe the beast as it stood in the forest, huge and motionless, metres from me, with a black shaggy coat of thick coarse hairs, large black tufted ears, a huge narrow head with close set eyes and a blunt wet snout scenting the wind. Wild Boar do not have good eyesight and rely on sense of smell and hearing to a much greater extent than eyesight. I spent twenty minutes with this pair but there was no sign of the piglets that my colleague had referred to. Where could they be? Pleased as I was to see these two Wild Boar I felt somehow cheated at not seeing any piglets. I walked off back through the forest looking for them but an hour's wandering around failed to find any sign of the coveted striped humbugs. More in frustration than in hope I walked across a very muddy and wide forest ride obviously used as access by forestry vehicles and headed towards a clearing on a small tree covered ridge on the other side. Emerging into the clearing I was suddenly confronted by two more Wild Boar, both of them sows, ambling towards me and joy of joy accompanied by two excitable piglets. Striped humbugs is the only description that can be applied to the piglets, their coat being overall the palest of fawn colour with darker grey brown stripes along their bodies breaking up their outline. Like all young animals the piglets were possessed with an abundance of surplus energy, and had a large quotient of the 'oh so cute' factor, bouncing around on stiff little legs, butting each other and rootling around in the earth but to not much effect. The two sows came right up to me and I found myself having to remember that these were actually wild animals although they showed no fear of me whatsoever. The sows were obviously expecting to be given food judging from their expectant behaviour but I had nothing to give them and indeed it is strongly advised not to feed Wild Boar. 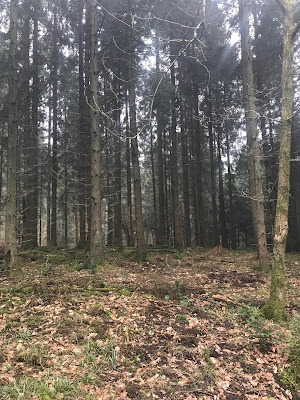 When they learnt I had nothing to offer them they grunted and ambled away, one to turn up the earth while the other larger sow had a good scratch, rubbing the side of her body against the base of a felled tree before they all trundled off the ridge, down the steep bank and into the dense cover of a stand of growing conifers. I could still hear them snorting and grunting, although now invisible in the trees and then there was silence. It was lunchtime so I returned to the car and made a short drive to a favourite local café in the nearby village of Parkend and refreshed myself with a coffee and a pasty. I smiled when I noticed they sold Wild Boar sausages. Whilst sat in the café I reflected on my experiences this morning and decided I still wanted to see more of the two cute piglets and returned to where I last saw them. Of course there was no sign of them or the adults and I wandered around the vicinity for some time but with no success. In a final show of desperation and feeling a little foolish I started to call out 'Here piggy. Here piggy. Where are you?' as if that would attract them but, believe it or not, the original two boar, the large male and his mate appeared at a run from out of the trees and stopped before me. But neither the piglets or the two sows had followed them out of the trees. I walked off down another track leaving the two boar and doubling back came across a muddy grassed ride and just as I did the two piglets emerged from the shrubbery and ran across the ride to join the two sows that were churning up the wet turf on the other side of the ride! An hour of bliss ensued as I indulged myself in watching the two piglets, forever active, horsing around and playing with each other. Who cannot fail but be charmed by their antics? They were never more than a few feet apart, constantly chivvying each other by sidling up sideways with their small bodies broadside on and then butting their heads sideways at each other in a tussle of strength. Tiring of this they then snuffled at various clumps of grass or in a burst of excess energy turned complete circles in mid air, round and round in a demonstration of gleeful exuberance and youthful innocence. Eventually the larger of the two sows lay down on the wet grass, flat out, closed her eyes and presented her teats to the two piglets who wasted not a moment in latching on and sucking away for all their worth. It did not last long but for the time it did was a picture of harmonious bliss, all taking place within a hundred metres of a fairly well used road. I left them then, feeling the time was right. Well somehow you just know when to go, don't you/?